The Political Tracts and Speeches of Edmund Burke, Esq. Member of Parliament for the City of Bristol. 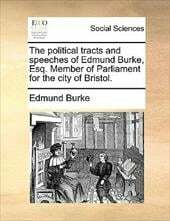 Details of the book - The Political Tracts and Speeches of Edmund Burke, Esq. Member of Parliament for the City of Bristol.